A year round art program. What great times we have together in art class! 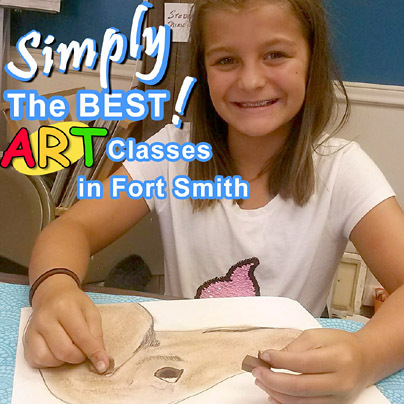 The best after school and year round program in art in the Fort Smith area. Research shows that developing both sides of the brain in a child helps to create balance in their life and they do better in school. So what better way to train the right side of your child's brain by enrolling them in an after school art activity program. Creativity is an important part of a child's life. >Children that have art training have higher standardized test scores. 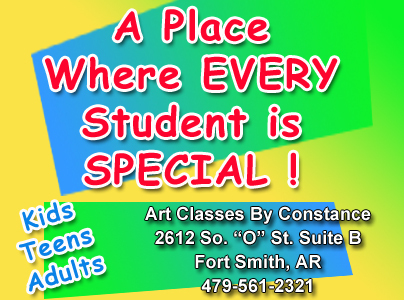 Classes are held at convenient times for parents and are centrally located in Fort Smith. 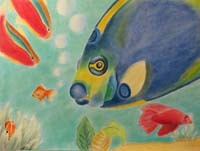 Art classes are held weekly after school and after work for parent's convenience and continue into the summer months. Summer classes are extra fun also. A great year round program. Most students stay an average of 3 to 5 years or longer. That's how great this art program is. Your child will learn from a professional artist. Let's get creative with colorful age appropriate art projects and a kid friendly instructor. Accepting students ages 8 years and up. Teen art classes are also available. Learn to draw and paint. A remarkable art program featuring creative development through drawing, painting, and sculpting. Creative art projects for children and teens that will develop their natural creative talent and promote self-esteem. 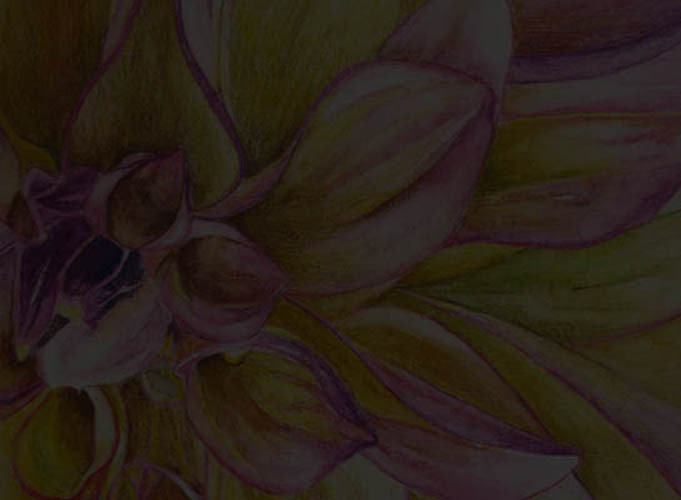 Your child or teen will discover their natural creative process during these art classes. Each art class offers a unique educational experience. 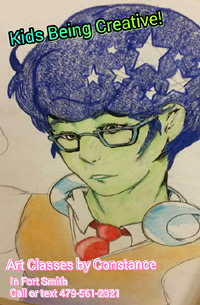 The art classes offer a variety of colorful artist materials and techniques, in a fun atmosphere. Kid's leave smiling with a great art project they are proud of. Come and join my other art students for creative fun. If you live in or around the Fort Smith, Arkansas area and would like to give your child this special opportunity, then call today for more information. Your child can start anytime. 2612 South "O" St. Suite B ( Near Christ the King School, on the same block as Ballman School, behind the Yellow Umbrella) Click here to see a map. YOUR CHILD OR TEEN CAN START ANYTIME CALL OR TEXT CLICK ON THE PHONE NUMBER 479-561-2321 NOW! Art is colorful and fun. 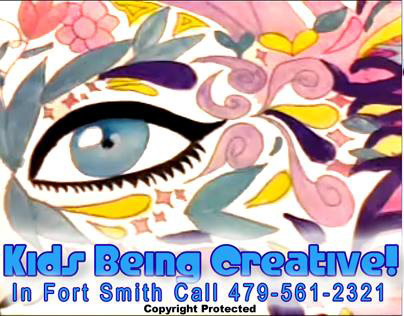 Kid friendly instructor teaching fun art classes in Fort Smith. Colorful kid oriented art lessons that teach the fundamentals of art in a fun way. Join the art classes at anytime. 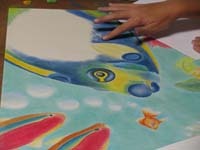 Summer classes are extra special with summer themes to many of the art class lessons. Centrally located in Fort Smith. Don't miss out on this special opportunity for your child to learn art. 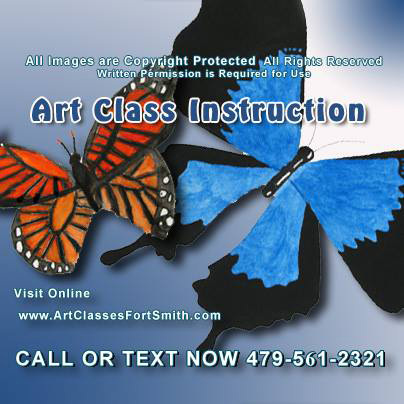 Call about art programs. A unique year round art program.